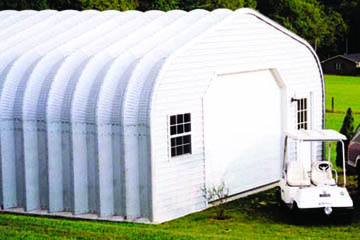 Our Steel Garage Buildings are the solution to any automobile and vehicle storage need! For all of your automobile storage needs, U.S. Buildings produces prefabricated garage kits for residential steel garages. We provide an easy and affordable solution to keeping your cars and trucks protected from the elements. Our prefabricated kits are fully customizable and competitively priced because we sell factory direct to the customer. By choosing our kits, you can have your new steel garage built in a fraction of the time it would take to build a traditional brick and mortar or wood frame garage. So why wait any longer? Build a prefabricated steel garage yourself with the help our easy instruction manual and take advantage of big savings! U.S. Buildings is an American owned company that provides the most advanced clear-span steel buildings in the world today direct from our factory here in Boone, North Carolina. We guarantee that our steel garage buildings are the best buildings you can find, at the best, most affordable price available. Our clear-span steel garages have been designed and engineered with the strongest materials to ensure that they withstand the toughest wind and snow conditions on Earth.